Feeling advent-urous this Christmas? 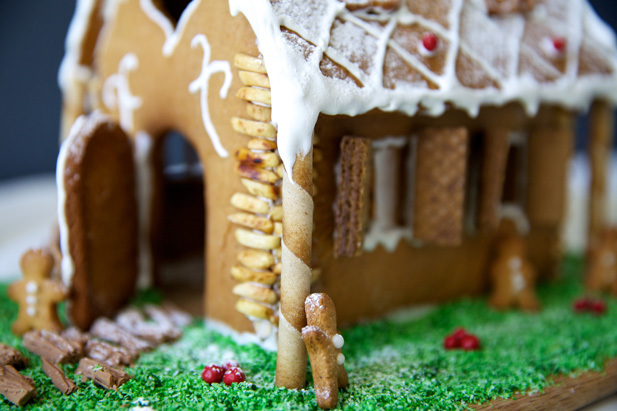 Why not dive into a long-standing European tradition and build your very own gingerbread house. You can make your house as intricate as the boundaries of your creativity allow but here’s a simple one to start off with. 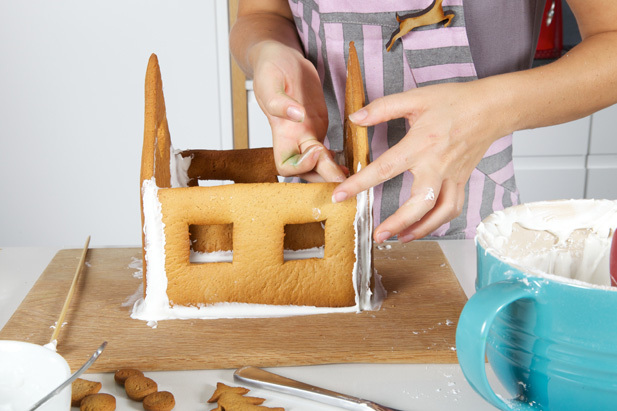 Here’s how to make a gingerbread house. 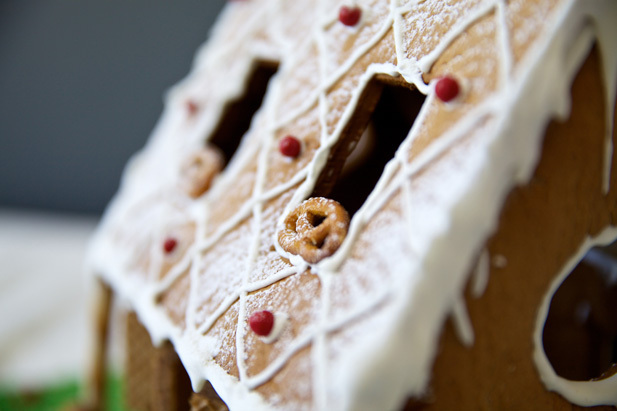 Gingerbread, known as lebkuchen (life cake) in German, was so called because the ginger preserved it for longer. Ode to sugar and spice and all things nice. We went for the unfettered look with natural ingredients like nuts, pretzels and wafers but if colour reins king for you, hit the sweetie aisles for some inspiration. This batter needs to rest for 12 hours before baking so best to prepare the day before you wish to bake. For the authentic German recipe, replace the bicarb and baking powder with 1 tsp each of pottasche (pearlash) and hirschhornsalz (hartshorn). 1. In a large sauce pan bring the honey, sugar and butter to a simmer, stirring the ingredients together. Remove from the heat and leave to cool. 2. Using a hand blender, whip the eggs and all the spices together until nice and frothy. 3. Add your honey mix to the whipped eggs and stir well. 5. The consistency of the dough should be quite heavy, springy and ever so slightly sticky. Cover this with a dishcloth and set aside to rest for 12 hours. 1. 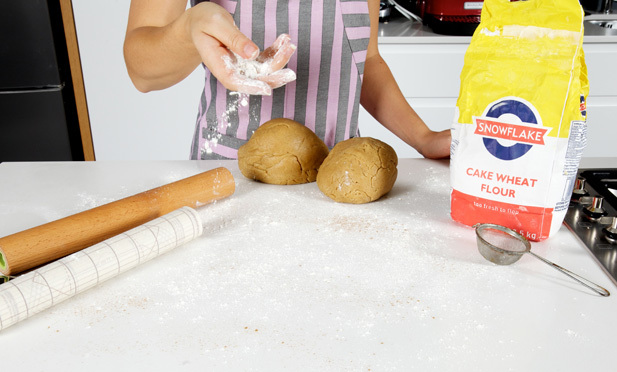 Give the gingerbread dough a good knead and roll it out onto a smooth, floured surface with a rolling pin to a thickness of approximately 5mm to 1 cm, depending on how bread-like you want your walls to be. 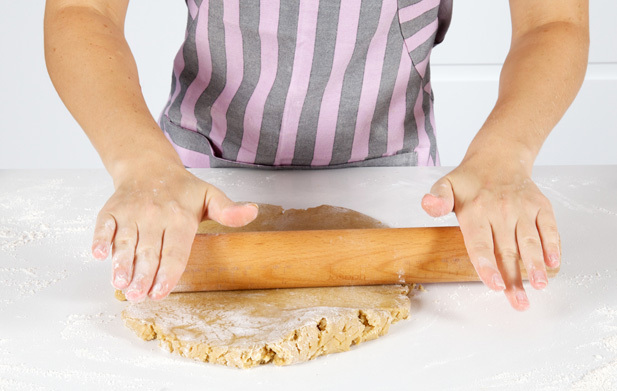 When it comes to the roof slabs, roll the dough out as thin as you can. The lighter these slabs, the better they are for construction. 2. Place your stencils onto the dough and cut out the shapes necessary. 3. 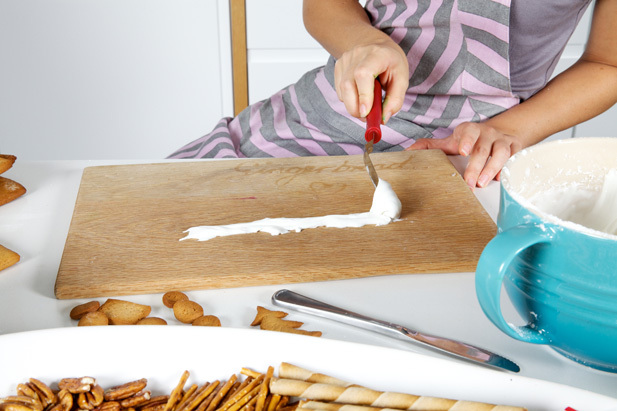 Grab a turner, dip it into the flour and shimmy it under your gingerbread house walls to loosen them from the counter. Place these onto the baking paper on your baking tray, being careful not to distort the shapes. 4. 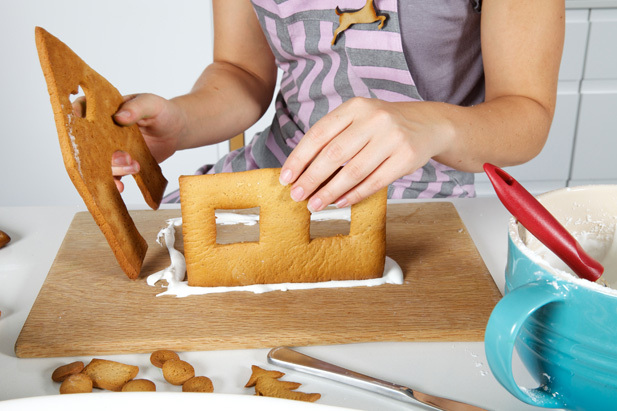 If you’re experienced or up to the challenge you can cut your doors and windows out before placing them on the baking tray, but to avoid too much distortion it’s best to do this once your walls are already on the baking trays. 5. Once you have all your house shapes ready on the baking tray, pop it into the oven for 20 minutes at 180ºC. Keep an eye on them though, depending on how thin or thick you rolled the dough, they might need a couple of minutes either way. Golden brown is good. 6. Leave to cool on a drying rack. The walls have to be cool before you begin assembling the house. Now for the icing and gingerbread house glue. Mixing icing sugar with water also works well, but the egg whites in the royal icing make for an egg-cellent glue. 1. 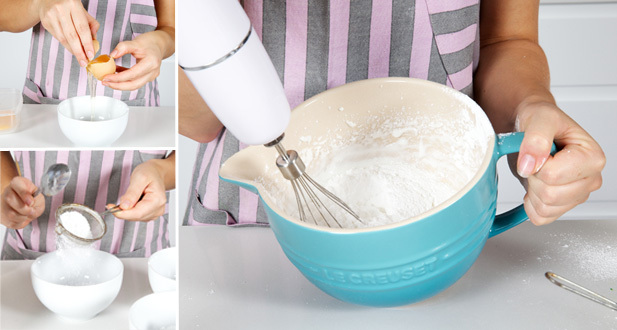 Put the egg whites into a squeaky clean bowl. Any residue will prevent them from whipping nicely. Beat with an electric beater until they form stiff peaks. 2. Once at this stage, add in your sifted icing sugar. Whip some more until a thick, glue consistency is formed. Depending on the size of the eggs used you might need to add in more icing sugar until you can see the consistency will make for thick glue that won’t run. 1. 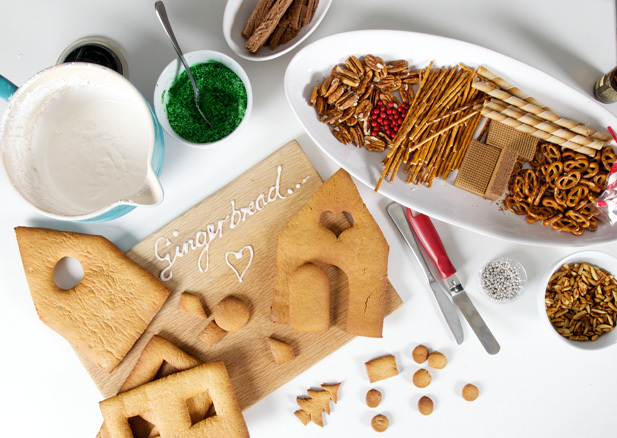 Get the surface ready that your gingerbread house will be standing on. 2. Take the back wall and one side wall, position them perpendicular to each other in the centre of the board, and draw a streak of icing glue onto the board where these two walls will sit. Leave this to set for a bit, then with icing glue at the joining edges of these walls, place your first two walls, and hold in place until set. Repeat with the other two walls. Be sure to face the ‘bottom’ of the wall biscuits inside so that the nice side faces outward. 3. 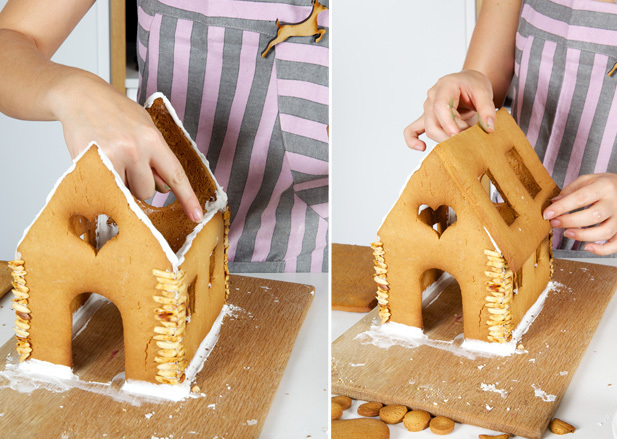 Smooth the icing glue into the corners and along all joining sides like you would with window putty or mosaic cement. 4. While the four wall joins dry completely, and before putting your roof on, finish off the corners of your house. We used roasted almond slivers to create brick work around the corners, and hide the joins. 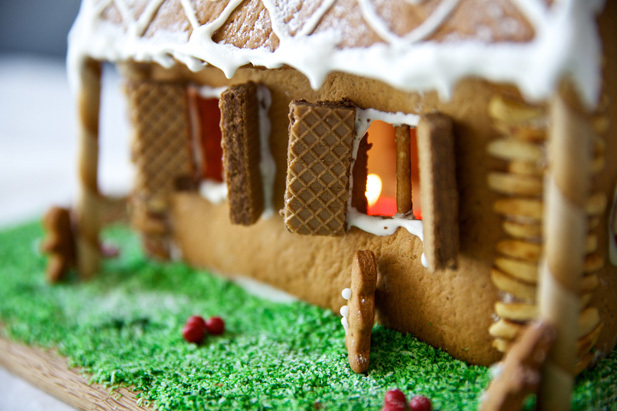 You could also cover your whole house in icing by using an offset spatula and stick candies on as you see fit. 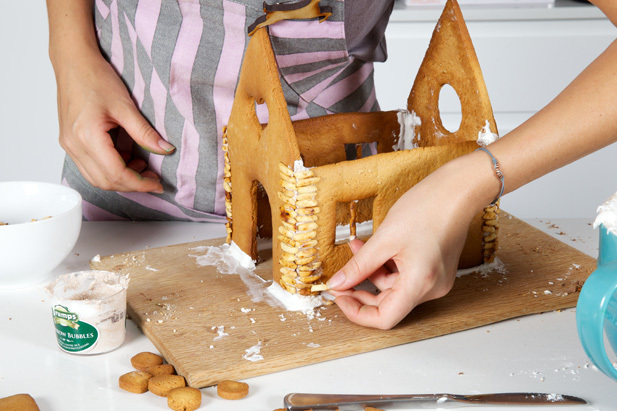 You can also use this time to put your chimney together (if you chose to fashion one from left over dough) and ice detail on the outside of your door. We used a coffee bean for the door handle. 5. Now ‘glue’ on your roof, making sure that the larger overhang is over the front door. Ice all joining sides or places of contact, position and hold until set completely. 6. If you made a chimney, glue that on with some more icing as well as the door at a slightly ajar angle. 7. From here on out, let your imagination run wild and decorate as simply or as elaborately as you please. We used pretzel sticks for a thatch chimney finish and pecans for a wooden roof ridge. The Cuisipro Deluxe Decorating Pen works brilliantly for some tile detail on the roof and colourful astros as berries on the roof or as fairy lights along the roof edge. Coconut mixed with green food colouring creates effective grass. 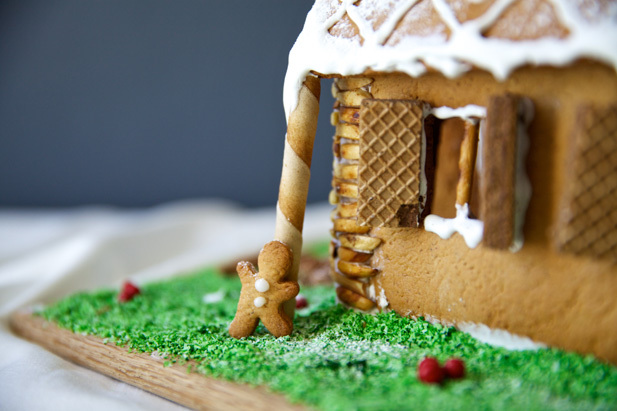 Wafer biscuits, carefully split down the middle, make a great window shutters and the wafer sticks help to support your roof structure and look like garden pillars. 8. 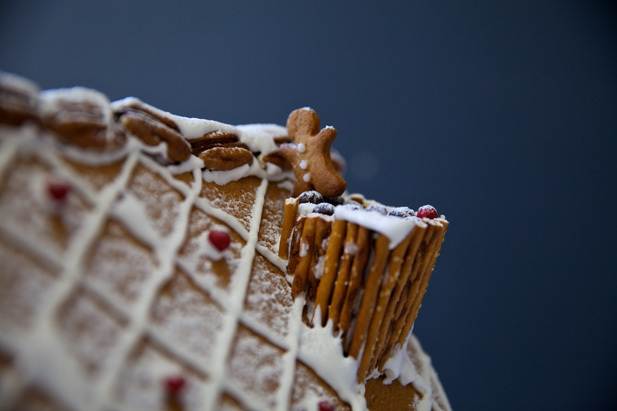 When all is complete in gingerbread land, use the last of your icing glue to add wisps of fresh snow to the roof and window sills. 9. For a final festive touch, let some fine icing sugar rain down on your house through a sieve. 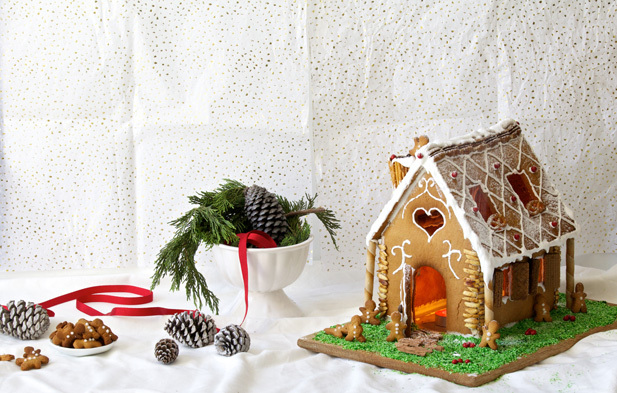 And just like that, you have your very own gingerbread house a la Hänsel and Gretel, cute as a Christmas button.